The runners and some of the catering team before it started to rain. 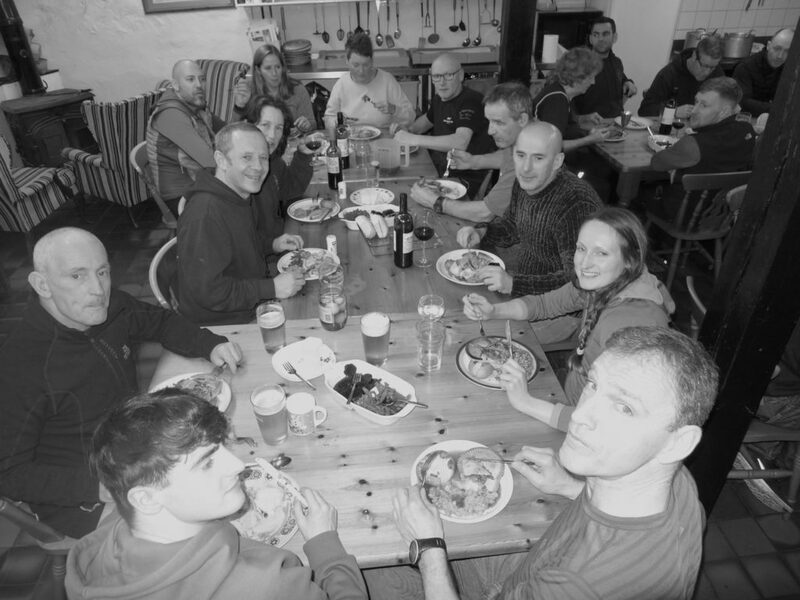 The annual fell runners meet at Bishops Scale took place on the last weekend of January. 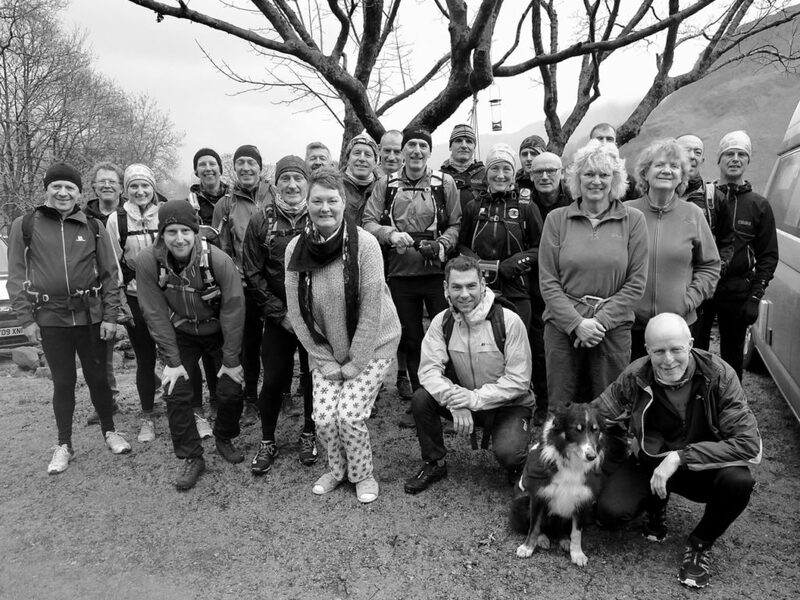 A group of approximately 30 runners, walkers and helpers congregated at the hut. Some effort was made to improve the profits of the Old Dungeon Ghyll on the Friday evening but most had hit the sack by midnight in preparation for a day on the fells whatever the weather. With the weather forecast not looking too promising and with most of the snow that had fallen the previous week having melted it looked like the bad weather option of the Langdale Horseshoe would once again be the route choice for the runners. As is often the case the weather forecast proved to be correct and by the time we reached Esk Hause what had been a reasonable morning had changed into very strong winds and heavy rain. It was good to see spirits were still high when we reached Three Tarns and everyone opted to continue over the Crinkles rather than dashing down The Band. Spirits weren’t so high by the time we reached Red Tarn and only Ozzy Kershaw and John Thompson set off up Blisco, the rest of us opting for the more direct route to the Old. In the Old we met up with the walkers who had just finished their walk to and from Cathedral Quarry. It wasn’t long before Rob Green (jnr) and Dave Jackson turned up – they had left us on the climb up to Stickle Tarn opting to include a few more tops. The cold got the better of most after a pint or two in the pub and we were soon on our way back to the hut for tea and showers. Warm, dry and enjoying the food and beer. Everyone was fully recovered in time for the traditional pie and peas supper at 7pm. Just like old times we were served a wonderful meal of soup followed by pie, peas and baked spud all for the cost of £4. Janet Makin I do believe that Arthur would have been proud of you. Thanks so much to Janet and her helpers who worked so hard to feed us. It was really appreciated by all those present. It was great to see so many people at the meet and it was especially good to see some who have been keeping a low profile recently. Lets hope for a drier day next year.